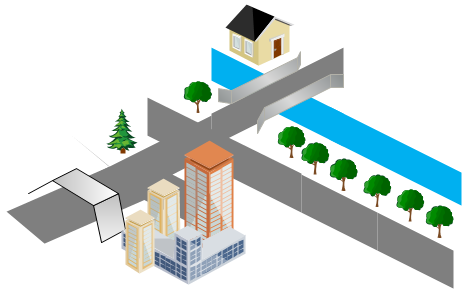 3D directional maps templates include lots of special shapes, road, elevated, tree roads, corner, cross walks, bridge, river, pedestrian bridge, one way, small block, long block, squire block, building block, house, office, building, factory, etc. 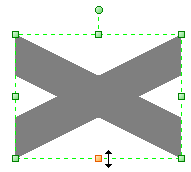 All these shapes will facilitate your drawing of the 3D directional maps you need. 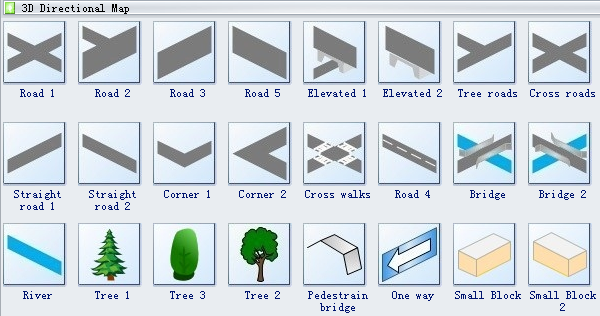 Road shapes, cross roads shapes, corner shapes, bridge shapes, elevated shapes, cross walks, tree shapes, river shapes and more are included here. Road shapes can be edited in a way as you want. Drag the yellow handle to change its size. Drag the yellow handle of the corner shape to make it fit to the road shape. 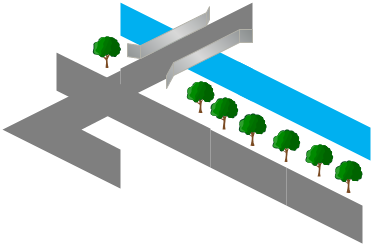 Rivers and trees can be used to decorate the maps. Pedestrian bridge is a bridge designed for pedestrians, cyclists, animal traffic and horse riders, etc. Building block is a basic unit from which something is built up. Cross roads are places where two or more roads meet. All types of block shapes, house shapes, office shapes, building shapes, store shapes, hospital shape, airport shapes and mark shapes are available here. Put the building, house, store, hospital shapes in a position you like. The car shapes in the map vehicles are pretty cool. Yellow cars, red cars, green cars, orange truck, limos and more are included in the map vehicles. All kind of cars are available in the map vehicles. If you do not like the colors of the cars, you may select the cars and choose the color you like from the color bar. 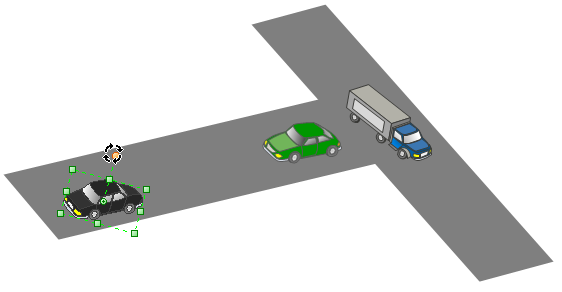 Adjust the driving direction of the cars by dragging the yellow handle. Need fresh looking 3D directional map symbols for your design? These 3D directional map symbols are a cinch to pop in. And their crisp, fine detail will make spectacular, easy-to-understand diagrams and presentations to your customers.